Columbus Union Depot No. 1 sometime between 1863 and 1866*. The camera is pointed northeast. The horse powered streetcar is southbound on N. High Street. Photo from the Donald A. Kaiser Collection. Columbus Union Depot No. 1 was a wooden barn like structure covering three tracks. It had an attached shed on the south side for a waiting room and ticket sales office. At some point in its 24 year life an attachment was added on the north side for a restaurant. CUD-1 was not an elegant structure. The two cupolas on the roof were to ventilate the steam locomotive smoke and fumes. Although the locomotives were stopped outside the depot they did run through the building leaving foul air and soot build up on the ceiling and walls. The depot was located 50' from High Street and 100' from Naghten Street. When CUD-1 is replaced this area became a small rail yard eventually the PRR's Yard 'C' (Produce Yard). The many tracks crossing High Street caused a safety hazard to pedestrians and horse drawn vehicles. In addition the trains would block High Street for long periods of time. As time went by blocking High Street became a major political issue. 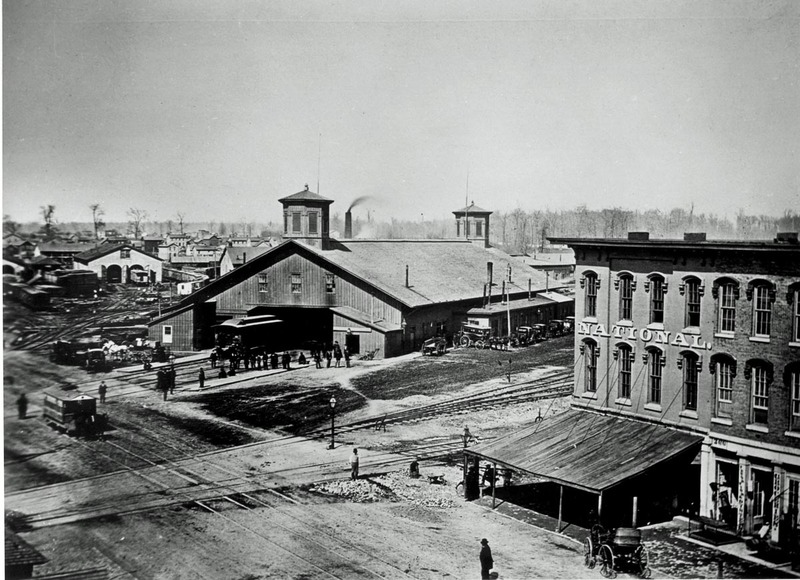 By 1873 with more railroads wanting to use the depot, plans were under way to replace CUD-1 with a larger depot and somehow to solve the High Street blocking problem. 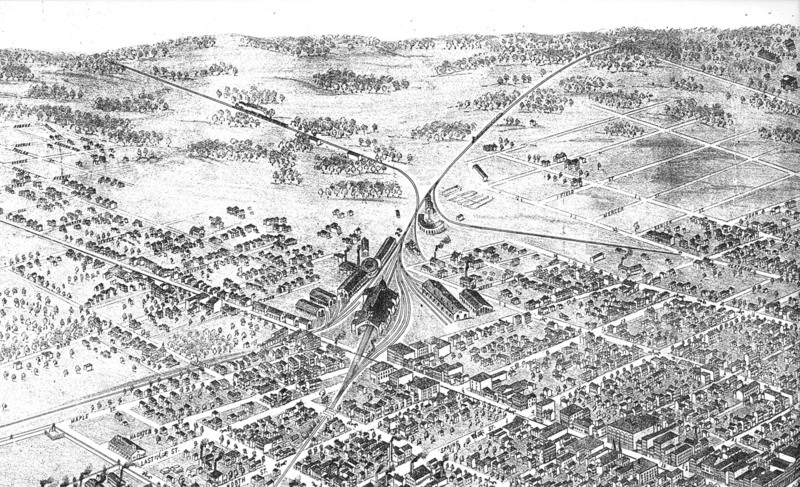 An 1872 birds eye view of Union Depot No. 1. Tag 1 - Columbus & Xenia Railroad, became the Pittsburgh Cincinnati & St. Louis Railroad in 1869. Tag 2 - Cleveland Columbus & Cincinnati Railroad, became the Cleveland Columbus Cincinnati & Indianapolis Railroad in 1868. Tag 3 - Central Ohio Railroad. Tag 4 - Columbus Piqua & Indiana Railroad, became the Pittsburgh Cincinnati & St. Louis Railroad in 1868. Tag 5 - Steubenville & Indiana Railroad, became the Pittsburgh Cincinnati & St. Louis Railroad in 1868. Drawing from the Terry Sherburn Collection. 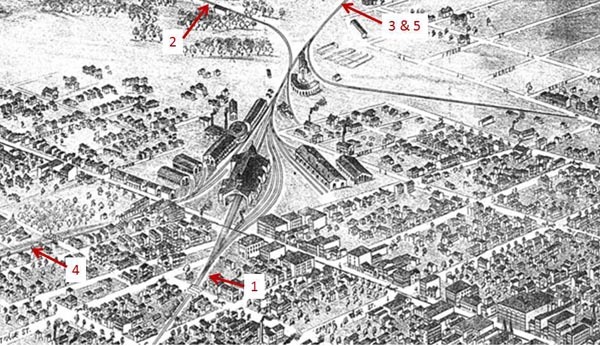 Orienting the depot on the 18 acre property so that each railroad could approach the depot was a problem. The Columbus Piqua & Indiana Railroad coming from the west could not enter the west entrance to the depot. CP&I Passenger trains had to pull past the depot and back in the east entrance, a time consuming and hazardous maneuver. A new depot was built in 1875. Located north of CUD-1 the new depot required the moving of the shop and repair facilities away from the depot area. More land beyond the original 18 acre plot was also needed. * A note regarding the date of the top photo: The Columbus horsecar system was built in 1863 to help handle the increase in Civil War travelers. This new streetcar system had double track on High Street between Union Depot and the Court House at Mound and High Streets. Shortly after the end of the Civil War in April, 1865 the streetcar business collapsed. The double track was replaced with a lighter rail single track and the two horse streetcars were replaced with smaller one-horse cars. That dates the photo between 1863 and 1866.